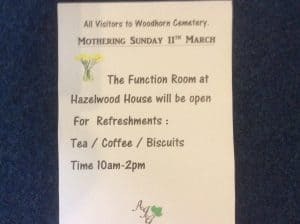 Feel free to pop in for a cuppa and a chat whilst visiting the cemetery. 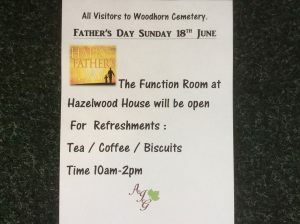 Similar to last year the function room at Hazelwood House will be open for refreshments on Father’s Day 18th June. Anyone visiting the cemetery or just passing by pop in for a cuppa and a chat.